The serious problem with this kind of mentality is that it overlooks the serious long-term damage that is done by poor liturgy and poor custom; it does not recognize that reform has to come from all sides, not just from the top down (which is usually ineffective anyway, as the consistent and yet consistently ignored legislation on extraordinary ministers of holy communion shows); and it fails to acknowledge that each and every bishop has the grave responsibility to take charge and take action when the Holy of Holies is at stake. Lex orandi, lex credendi: the way people worship determines what they believe. The lack of a spirit of reverent adoration at so many liturgies, together with the countless ways we have abandoned our holy tradition, is the root cause of why Catholics believe so little nowadays, have so little reverence for the Eucharist, and dissent so blithely from Church teaching, especially in matters of morality. Indeed, what we have done to our Church in the past five decades deserves to be punished with loss of faith, desecration, scandal, and moral confusion. The Lord will not be mocked: those who repudiate His gifts will be repudiated, until and unless they repent. A bishop might also be tempted to think: “Summorum Pontificum is a nice idea, in and of itself, and the enthusiasm among some young people for Latin, chant, and what have you is all fine and good, but we have to concentrate on the basics of faith and morals—we can’t waste precious time and energy promoting such exotic causes.” But this is exactly wrong. The liturgy is the tip of the spear. If you sharpen it, you succeed in your hunting. Once the right priorities are set in the sanctuary, the right priorities begin to be set elsewhere, too. First things first. The Church is mainly about the business of worshiping God and sanctifying souls, and this takes place above all in the sacred liturgy. 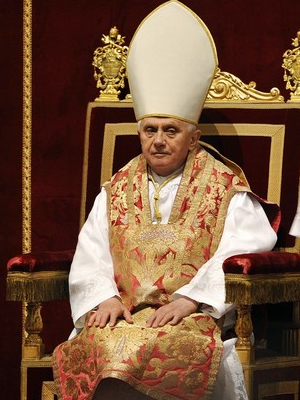 As we know from the luminous teaching and example of Pope Benedict XVI, many treasures of our faith, particularly in the liturgy, were not supposed to vanish from the Church’s life after the Council. They did vanish in most places—but their absence is in no way normative! It’s as if everyone in a family decided to stop paying attention to Grandma. Grandma does not disappear as a result; she just rocks in her chair in the corner, waiting until someone will talk to her again, will love her and show her due respect. The Tradition does not lose its normativity just because ungrateful revolutionaries turn their backs to it. Against the argument that “we don’t want to make the same mistake as before, by too suddenly changing things and so risking alienating good people,” it should be said that in the church, as in one’s personal moral life, certain mistakes deserve to be undone, the sooner the better. Pastors owe it to their flocks to lead them into the truth that sets us free, even when it is painful, even when some will walk away (cf. John 6). The main problem is that the longer the abuses and the spirit of rupture prevail, the more quasi-normativity they acquire—so much so that Catholics today frequently see the aberrations and experiments of the past forty years as “tradition,” when in fact they are pure innovation, novelty, and rupture. You cannot make a lion into a tiger, no matter how much you paint stripes onto it. Similarly, a defective stance vis-à-vis tradition can never be rendered legitimate, no matter how many decades it lasts. If the papacy had remained in Avignon for centuries, it would be no less an embarrassment, abnormality, and scandal, no less immune to the critique of whatever Saint Catherines the Lord in His mercy would raise up. In fact, it would be more scandalous the longer it lasted. The same is true with liturgical abuses and rupture. They are not normalized and regularized by their continuation; they are rendered all the more displeasing to the Lord and harmful to the faithful. The longer the hermeneutic of rupture and its expressions are allowed to continue as practical norms, the longer a “Great Schism” between the preconciliar and postconciliar periods will be perpetuated. A house divided against itself cannot stand; neither can the Church be the leaven of the world unless she brings order to her own household. We can pretend all we want, but the naked truth is that the Catholic Church as now embodied in most parishes and their manner of worship is something that could not be recognized as being in continuity with her traditional doctrine and practice. In other words, there is a Great Divorce. To the extent that this is true, there is a real, pressing, desperate need for healing, reconciliation, and reunification. The only way to achieve reform is to have the courage to begin it, and to continue it in a consistent and principled way, as did the great saints of the Counter-Reformation. Though it may sound simplistic, it is nonetheless true: where there is a will, there is a way. Some Catholics will make a fuss and threaten to quit, but ultimately, it is the Catholic’s duty to stick with the Church, not the Church’s duty to adapt herself to the whims and tantrums of the people. There must be true leadership that leads the way along the path of Tradition, and does so with consistency, fervor, and vision. Doing the right thing can mean standing against many. Doing the right thing is the only way of setting up a counter-example that inspires others by its integrity. It is like soldiers making a stand: behind them more and more gather until the tide of battle turns.